Hiiu and Kivimäe are sub-regions of Nõmme, geographically in the central area of Nõmme. Kivimäe (Stone Hill) sounds strange in a city of lots of blocks because there isn't any block area there. So this name certainly came from something else. And as before, there are mostly non-blocks posted. A school at Vabaduse pst. which goes straight through Nõmme. This was probably at Kerese street which is rather in Männiku sub-area. I've had a hunch for years that there are some hidden blocks in Nõmme that are not directly visible from Vabaduse pst. So here I saw them first time from a viewing platform right next to Pääsküla bog (over the bog). This is a soviet-time-built medical complex in Hiiu. This is probably the building at Tähe street. More of these below. Since I saw those blocks, I went to another trip three days later to really see them close. And a lot more than that. This is close to Hiiu stop at Vabaduse pst. I had a hunch about this block too. It is almost solitary. Today it has been renovated to yellow, there will be photos later. This is the neighbouring block from back side. It looks very unique and cosy. Here I reached few blocks at Tähe (Star) street very close to medical complex. Unique blocks! 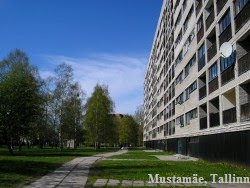 There just few other examples of this block in Tallinn, also in Nõmme. There are only few blocks here. From here I was heading towards Vanemuise street. I had never walked there before and there were surprises. Such building is usual in smaller towns. I think such houses were only for select few back then when they were built.